Faith Hill is launching her first fragrance with a series of short webisodes. Included in the series are conversations with other women, behind- the-scenes videos from her photo shoot, and more. Hill also appears in a new public service announcement encouraging Americans to volunteer their time. The 30-second spot is one of a series of PSAs to be launched this fall on all major broadcast networks – ABC, CBS, FOX and NBC – as part of the Entertainment Industry Foundation’s iParticipate national initiative to promote volunteerism with AARP’s Create the Good. Taylor Swift is getting her own signature guitar line in collaboration with Taylor Guitars. 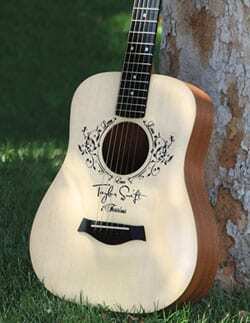 The Taylor Swift Baby Taylor guitar (TSBT) is a compact model that features Swift’s design touches. Based on the best-selling Baby Taylor guitar, the TSBT is three-quarters the size of a standard dreadnought, with a slim 1 11/16-inch neck. It is a good size for traveling. The TSBT will be offered at a manufacturer’s suggested retail price of $398.